Increases the Highly Compensated Employee Exemption to $134,004. The final rule does not make any changes to the duties test for executive, administrative and professional exemptions. We will continue to update you regarding the far-reaching implications of this significant development. 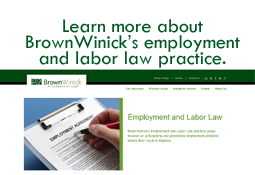 In the meantime, contact Beth Coonan or or any of our Employment & Labor Law Practice Group Members for more information about the impact of these sweeping changes on your business.